This is the Canary bellflower which you can find it in laurel forests, and ocassionally on the edge of a field. The plant has a tuber which produces a scrambling vine each year up to 9 ft long, and it produces flowers all winter. 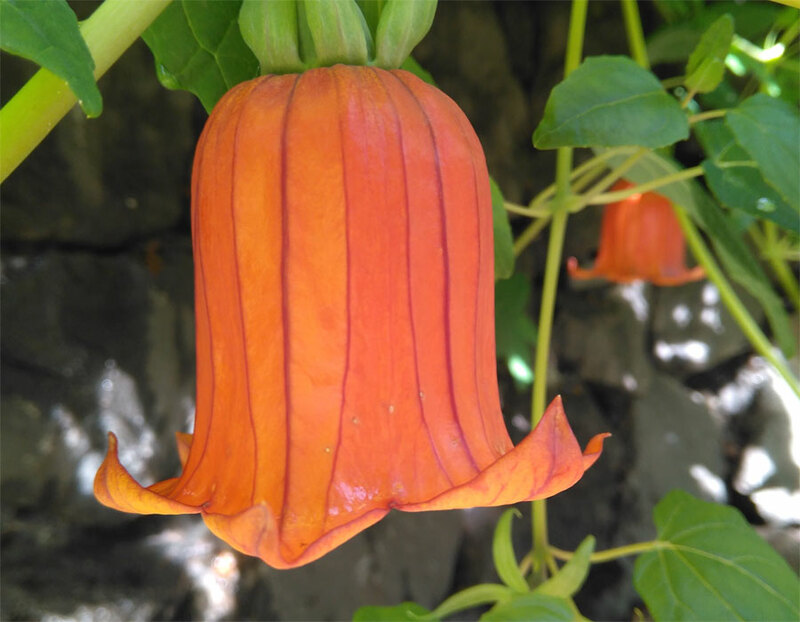 The flowers are orange, about 2″ long, and have very pretty veins. I believe the black or purple fruit is edible, but I’ve never tried it. It’s only recently been taken off the official list of endangered species! There are lots of them growing at the back of the vistor centre in Los Tilos, and at La Zarza. I believe they’re becoing popular for gardens in places with a Mediterranean climate, but they won’t survive frost or very hot summers.